I don't know why it's taken me so long to get a matte top coat, but I finally picked one up from Nails Inc this week! It's the 'Westminster Bridge topcoat' which is £15, but I got this on allbeauty.com for only £2.95! I know it's the old bottle shape but who cares, really? I should've picked up 2 to be honest. With the weather and the general January-ness of this month I wanted to go for a dark, sultry colour. It wasn't until I'd put this colour on that I realised it's a gel effect, probably not the best finish to pair with a matte top coat, right? But this is the shade 'Grosvener Crescent' and it's such a nice, really dark deep purple shade, obviously applies like a dream because it's Nails Inc! I put the top coat on after leaving the colour to dry for a while and then this dried almost instantly! I'm really impressed with how strong the matte effect has turned out even on a gel effect polish, so I would definitely recommend picking one up if you like a matte finish! Definitely easier than buying all your favourite shades in a matte formula. 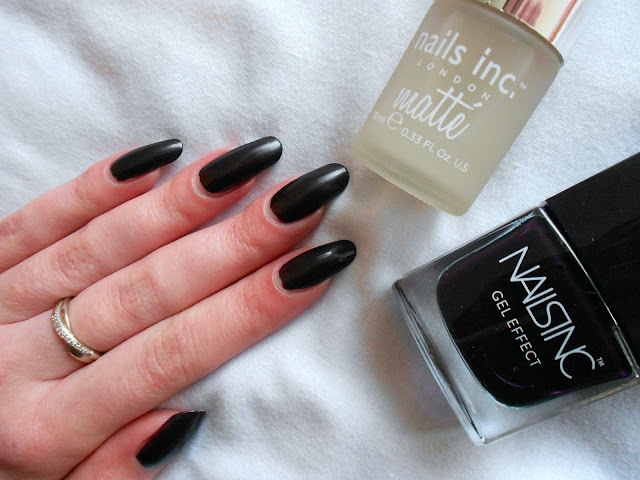 Have you tried a matte top coat?